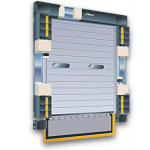 The Serco S-600 Stationary Head Pad Dock Seal is typically ideal for smaller doors (9′ by 9′ or less). The S-600 seals automatically as the trailer is backed against the foam pads. Roll-formed galvanized steel framing warranted for 5 years against rotting, splitting or cracking. 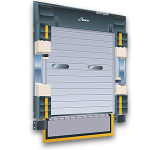 The Serco S-700 Head Curtain Dock Seal will accommodate a variety of trailer heights and is designed for doors that are 9′ tall or over. The S-800 Adjustable Head Pad Dock Seal can be manually positioned within a 48″ range and is an excellent choice for sealing a full range of trailer heights. Adjustable spring-tension system provides for adjustment of counterbalance and horizontal tilt for smooth, jam-free operation. The Serco S-1000 Ultra-Seal’s patented design provides the insulating benefits of a dock seal and full trailer access like a dock shelter. The one-piece, diagonal-cut foam construction, with internal retention straps, enhances foam memory and retention while looking good on your dock for years. 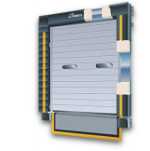 Ultra Seal seals rear hinge gap on trailers without obstructing doorway. The Serco S-2000 Ultra Seal utilizes the same versatile design as the S-1000 but adds an adjustable head curtain that enhances the seal’s effectiveness by accommodating a variety of trailer heights. Designed to make your dock seal last at least twice as long, the Guardian features a two-piece head pad system with a mobile front pad. This durable head pad slides up to 6″ with the trailer as it moves for load weight changes, air ride suspensions or yard spotting tractors. TEK screws provide firm attachment of sliding wear pleat system to side pads. 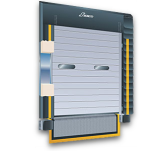 The Serco S-3000L L-Pad has a unique design that provides the insulating benefits of a dock seal plus the full access of a shelter. The side pads are foam-filled and uniquely designed to provide the flexing action of a shelter and the fit of a seal. 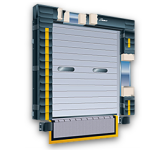 The high-density foam core provides full recovery to the stored position. The Serco S-3000HL L-Pad has a unique design that provides the insulating benefits of a dock seal plus the full access of a shelter. The side pads are foam-filled and uniquely designed to provide the flexing action of a shelter and the fit of a seal. Hood curtain splits offer load relief and higher clearance. Fiberglass stays add stiffness to hood to prevent sagging. The Serco DryDock keeps external moisture out of the loading/unloading area with an ingenious wiper pad that engages the trailer at the door – ingenious because it works so well and yet is so simple, it requires hardly any maintenance at all.